What is the SPL (sound pressure level)? 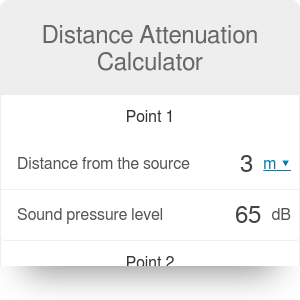 This distance attenuation calculator is a tool that lets you analyze how the sound propagates in the air. The further away you are from the sound source, the lower is the perceived sound intensity. The exact relationship between the sound level and distance can be described with the use of the sound attenuation formula. In this article, we will show you how to calculate the exact sound level at any distance from the source. We will also provide you with a rule of thumb to quickly estimate the drop in volume - without using any calculations whatsoever! All sounds that we hear are nothing but vibrations traveling through the air (or other mediums). These vibrations exert a certain pressure on our ears. One of the ways to measure this sound pressure is using regular units of pressure, called Pascals. This approach is hugely inconvenient. Why? The quietest sounds we can hear - our hearing threshold - is about 0.00002 Pa. Expressing the sound levels in thousandth parts of Pascals in all but intuitive. This is why, instead of regular pressure units, we use dedicated sound pressure units called decibels. The decibel (dB) scale is logarithmic, meaning that an increase of roughly 3 dB is equivalent to doubling the pressure if expressed in Pascals. When SPL is given in decibels, we can estimate the pressure of everyday sounds usually in the 20-100 dB range. 120 or 130 dB is the threshold of pain - for example, a jet aircraft taking off in your immediate neighborhood will emit this level of sound. Sound attenuation describes how the SPL changes with increasing distance from the sound source. For example, you can imagine two houses standing close to a highway. If you measure the distance from each of the buildings to the road, as well as the SPL in one of them, you will be able to calculate the sound level in the other house. R₂ is the distance from the sound source to point 2. We have just calculated that when the distance from the sound source is two times smaller, the sound pressure level increases by 6 dB. What does it mean? Hopefully, you remember that an increase of 3 dB means doubling of the sound pressure. Following that logic, a gain of 6 dB is actually a fourfold increase in SPL. Each time you reduce the distance to the source by the factor of 2, the SPL increases by a factor of 4. This rule is known as the inverse square law. You can use it to roughly estimate the change in SPL without actually doing any real calculations. If you need exact numbers, though, don't hesitate to use this distance attenuation calculator! Distance Attenuation Calculator can be embedded on your website to enrich the content you wrote and make it easier for your visitors to understand your message.